In early July 2012, the hacker group D33Ds Company published on its website a text file with email addresses and passwords of over 450 thousand Yahoo users. Most probably, this massive theft became possible thanks to an SQL injection, since the file contains the names of variables, columns and rows from MySQL tables. 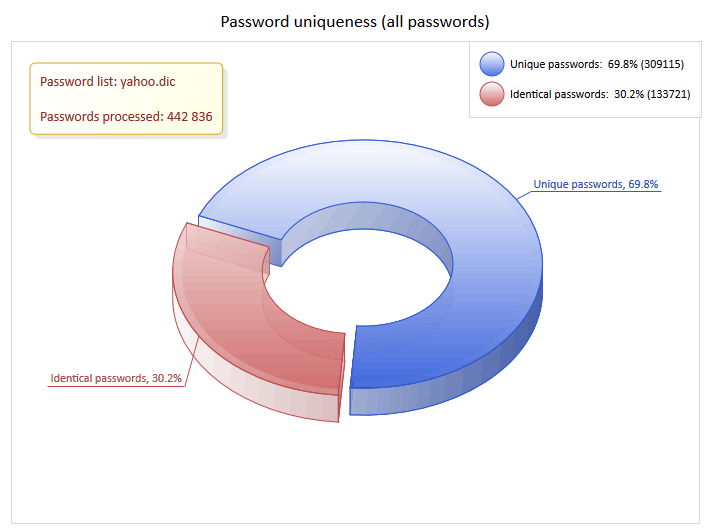 This article is an overview of compromised Yahoo passwords that can be compared with our previous Rockyou's analysis. 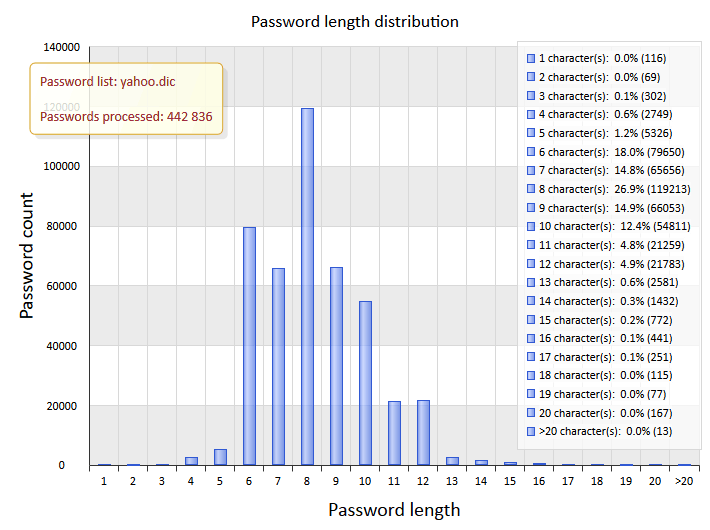 The statistics collected for the article were put together using Windows Password Recovery, a password audit tool. We had previously proposed that if 10 most popular passwords were used in over 1% of user accounts, such a database became insecure. In the database we're analyzing, this parameter is close to 1%. 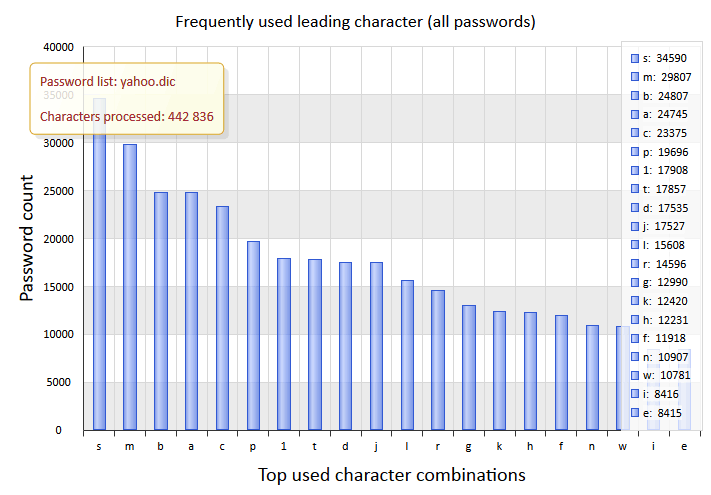 Although the small number of processed passwords do not provide the full picture of the system, the overall trend is likely to span across the entire database, which tells us that over 30% of all passwords are not unique - that is, the password of each third user of the system has a duplicate. 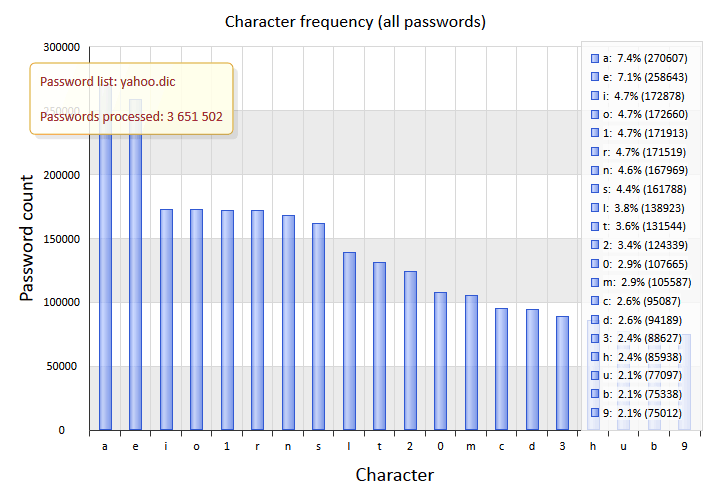 According to the length chart, most passwords consist of 6-10 characters. They account for around 87% of all passwords, which is in the same ballpark with the Rockyou database (86,5%). The most popular passwords consist of 8 characters, which is almost 27% of the total number. tonylovesbiscuits - who doesn't like biscuits? platinumwindow861 - owner of a new version of Windows? The length of a password is one of the key determinants of its reliability. However, the diversity of its elements is a lot more important characteristic. Despite the conventionalism, this diversity is usually measured in the number of standard character sets used (for instance, a set of lower-case Latin characters or digits). 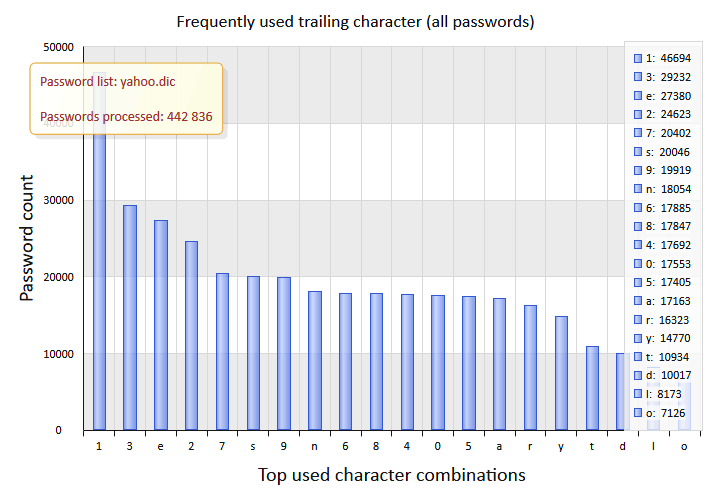 Statistics show us that 39.4% of all users pick simple passwords that consist of a single standard character set. Besides, 5.9% of them use purely numerical passwords. 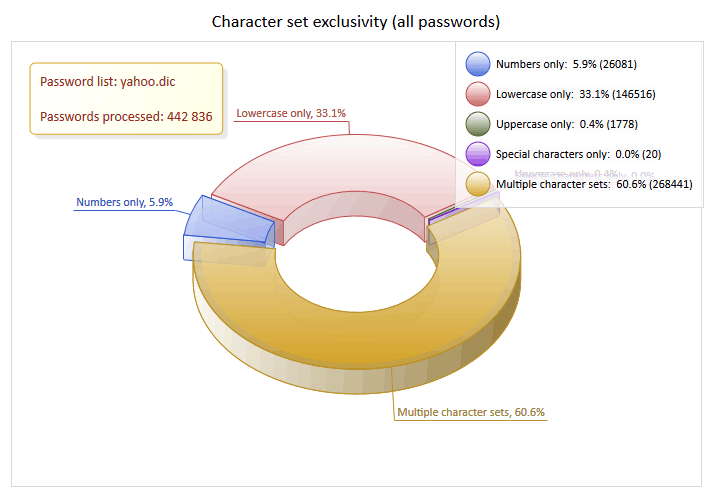 Two-set passwords account for 53.1% of the total number of passwords. 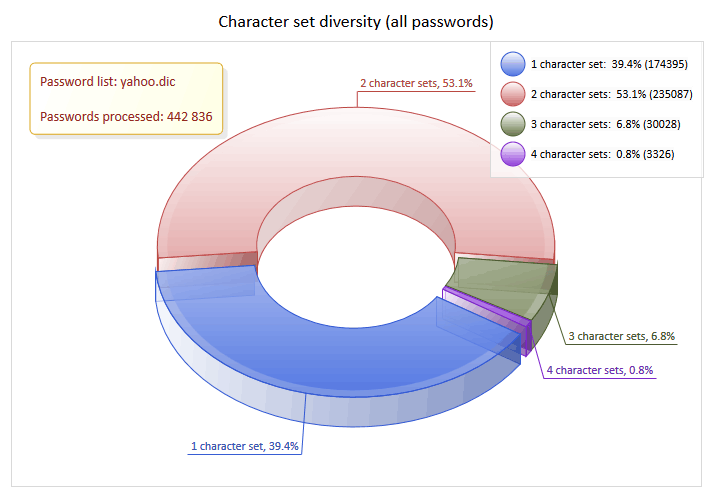 The remaining 7.6% are complex passwords using 3 or more character sets. The number of password covered by these masks is 261954 or 59.2% of the total number. 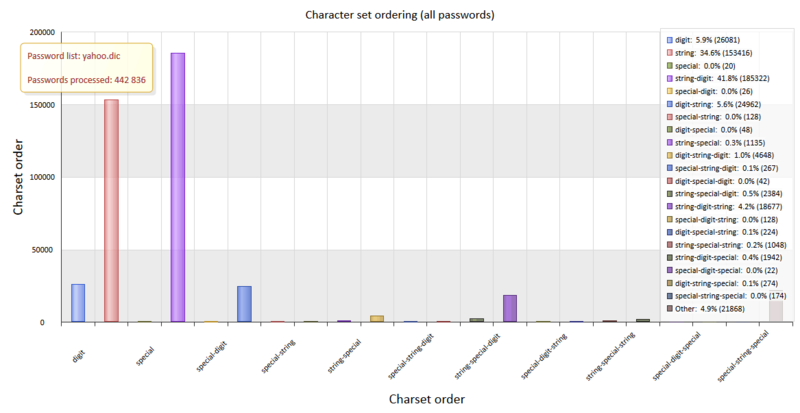 As you can see in the chart, many passwords consist of lowercase Latin characters. However, most users still add a digit or two to the end of the letter part of their passwords. As a conclusion, here are a couple of charts showing the occurrence statistics for different characters.